When I started implementing AM and FM demodulation for the RF Analyzer, I first built a receiver in GNU Radio Companion and then tried to rebuild it in Java. The basic blocks in the receiver are pretty simple and soon I had working code. But I had to recognize how poorly it performs on an Android device with limited CPU power. I was far from performing demodulation in real time and so I had to re-build many parts and optimize them. Here's a little post about some of the things I did to optimize the demodulation process and get it running in real time. 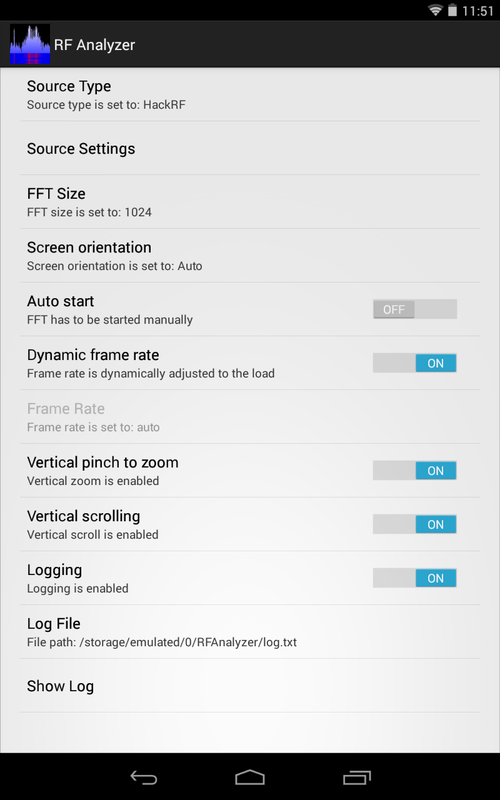 By the way: The version I am talking about is RF Analyzer 1.07. Available on Google Play (https://play.google.com/store/apps/details?id=com.mantz_it.rfanalyzer) or, if you want to have a look into the source code, on GitHub (https://github.com/demantz/RFAnalyzer). I've got a hint from Michael Ossmann to use single precision floating point variables instead of doubles. This this turned out to be a very significant optimization since it speeds up every operation performed on the signal samples. Version 1.08 contains these changes along with some other, rather minor optimizations. In order to shift the interesting signal down to base band it has to be multiplied by a complex cosine. This has to be done before any sample rate decimation is possible and therefore this will always run at the highest sample rate in our receive chain. This lookup table strategy effectively gets rid of any multiplications needed for downmixing and speeds things up a lot. The next block is a decimating low pass filter used to slice out the interesting signal and decimate the sample rate. It enables the actual demodulation process to be performed in real-time at a much lower sample rate. However, the decimating low pass will still run at the high sample rate and is therefore our next target for optimization. A half-band low pass filter. 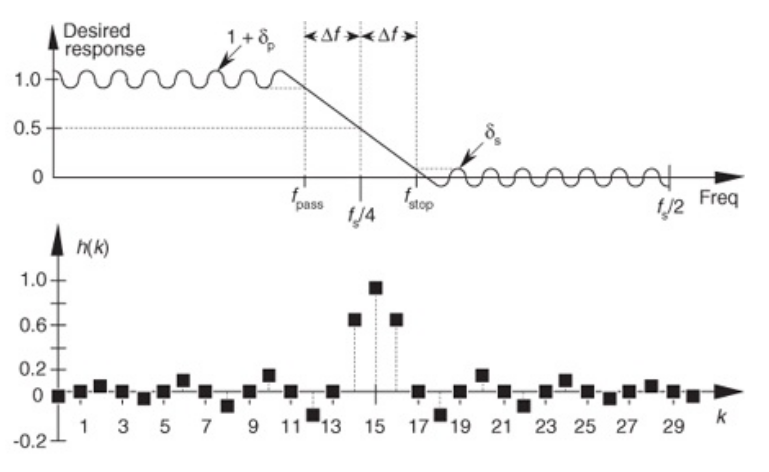 Graphic from Richard G. Lions "Understanding Signal Processing"
Because every second filter tap is zero we can implement this filter to require only half the multiplications needed for a standard FIR filter. We will also take advantage of the symmetry of the filters taps, effectively reducing the number of multiplications again by factor two! Finally I implemented the filter in a very un-flexible way by hard-coding the filter tap values into the filter method. This gets rid of some conditional structures and array lookups in the code and makes it very fast at the cost of very ugly, un-flexible code. By cascading a variable number of these filters we can decimate the sample rate by every integer power of 2. Note that the last filter in the line should always be a regular FIR filter with cut-off frequency < fs/4 to avoid aliasing. It is obvious that we should take advantage of today's smartphones having multi-core CPUs. That's why we separate each block in our receiving chain into its own thread. Every blue rectangle is a separate thread. The blocking queues help to synchronize them. It is very important that we reuse the buffers by passing them back to the previous block every time we finished processing them. This will avoid memory allocations at runtime and the garbage collector going crazy. The above design and implementation choices helped me to get demodulation running in real time. But this is only true if you run it on a device with a decent quad-core CPU. I don't have an old phone to test it on a weak CPU but I'm pretty sure it won't work on a dual- or single-core device. If you tested the application on your phone, please leave a comment and tell me the device type and your experience. I will try to further optimize the demodulation chain in order to get it running on older devices too! And of course to save battery! Any tips or hints are very welcome! It is still very basic and I have a lot of ideas to extend its functionality, but I thought it's better to have testers involved as early as possible. 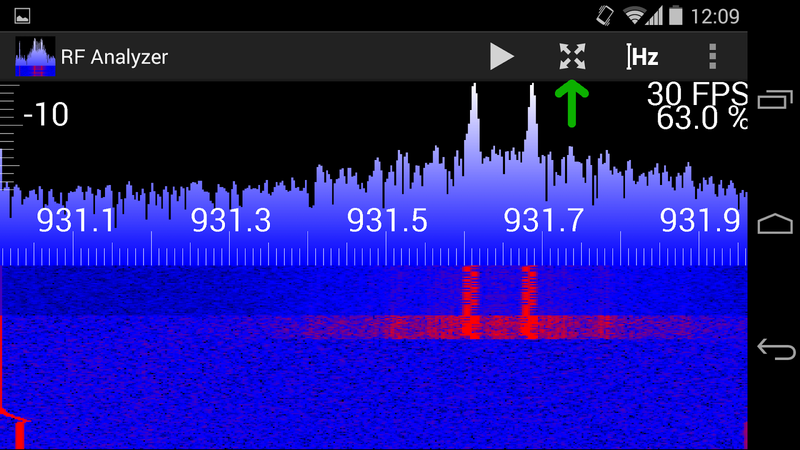 Eventually it should evolve in something similar to GQRX, supporting different modes and devices. But that will take some time! See the readme on GitHub for a more detailed description! In this blog I'm going to show what you can do with the app and in the end I explain how it is working internally for those who like to play with the source code. I also tried to document the code as good as possible, but it is always easier if the basic flow of the program is explained before looking at it. Turn on logging and set the location of the log file. 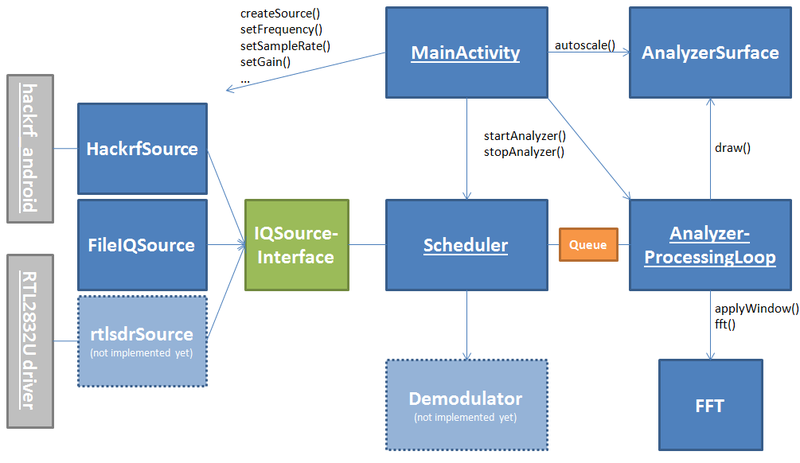 (Uncomplete) class diagram of RF Analyzer. Underlined classes are running in seperate threads. Gray elements are external modules. To support different devices I defined a common interface that is implemented by all classes which represent sources of IQ samples. 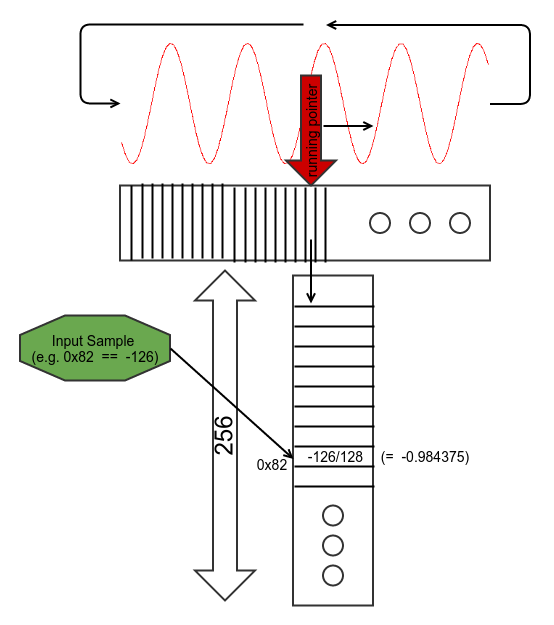 The Scheduler will continuously read samples from the source to prevent the receive buffers of the device to fill up. It forwards samples in packets of the size of the FFT to the AnalyzerProcessingLoop by inserting them in a queue. If the queue is full, the samples are thrown away in order to not block the input device. The AnalyzerProcessingLoop also runs in a separate thread and reads the sample packets from the queue, processes them with the help of the FFT class and then calls draw() on the AnalyzerSurface. This method draws the given FFT samples on a SurfaceView and also draws a new line of the waterfall plot as well as the horizontal and vertical axis. For a more detailed impression of how the app works, have a look into the sources on GitHub. I tried my best to add helpful comments to understand the flow of the program. 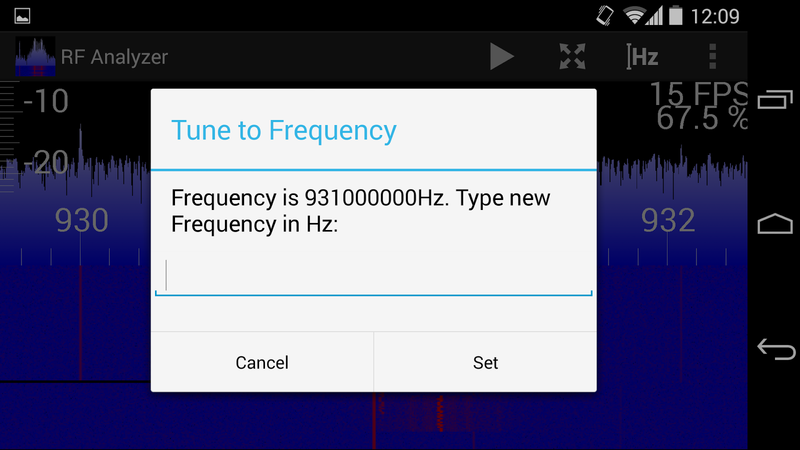 So the hackrf_android library is entirely written in Java. I thought about using Java Native Interface (JNI) to just reuse the original code from hackrf.c without modifications, but I decided not to do so. The advantage of a pure Java library is, that it is very easy to use (no need to care about NDK and JNI stuff). However, using the JNI approach would have advantages too, e.g. 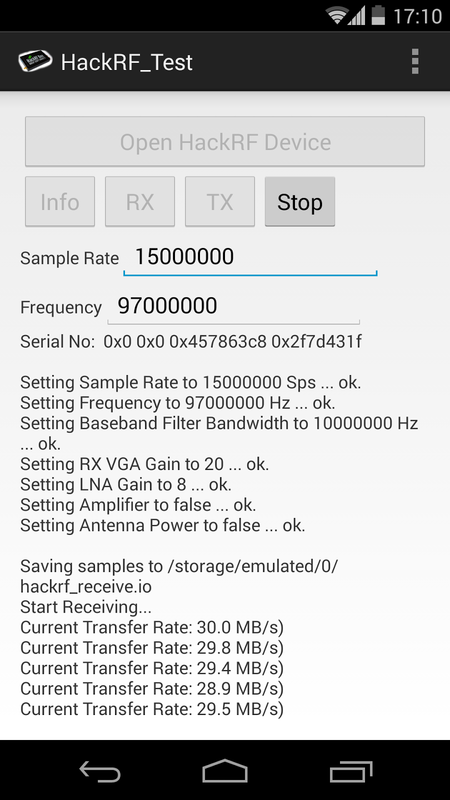 the hackrf.c code is completely tested and it fully implements all features. So maybe in the future I will give it a try. The repository contains the library sources and an example application. Binaries of both are also in the rep if you don't want to build them on your own. 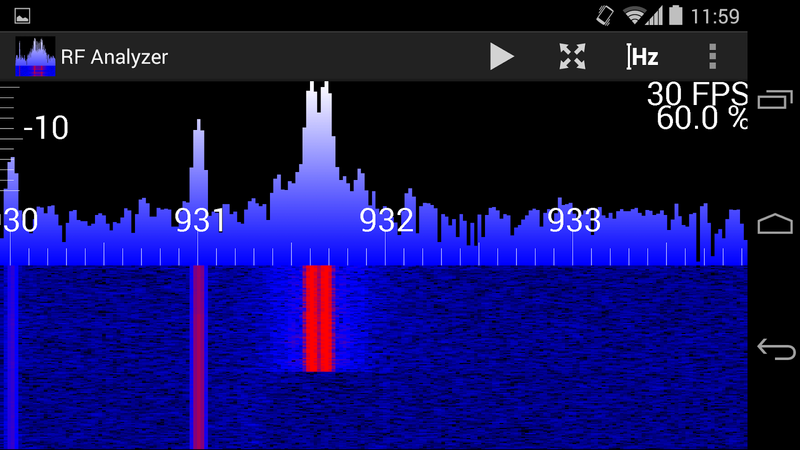 Basically the library consists only of the main class: Hackrf. In addition there is an HackrfUsbException class and a HackrfCallbackInterface which both don't contain much code. 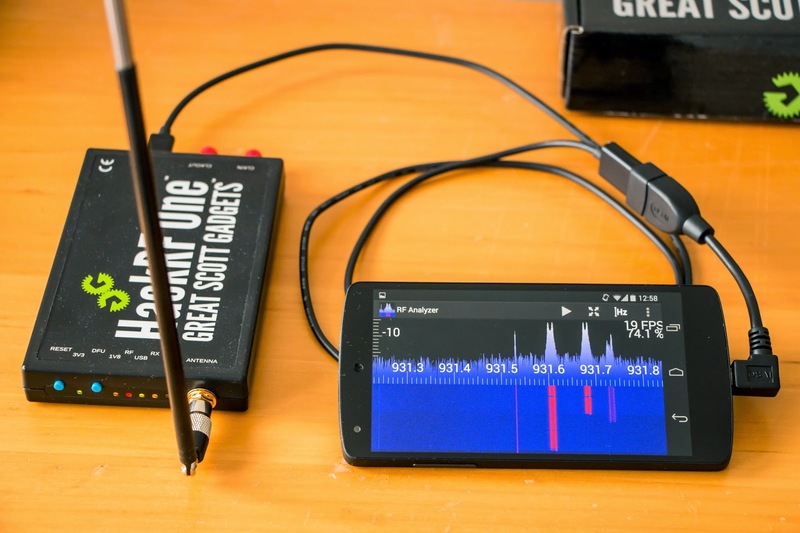 The Hackrf class has a static method called initHackrf(). This method will try to enumerate and open the HackRF on the USB port. This will require the user to hit OK when he is asked for the permission to do so. Therefore initHackrf() works asynchronously. It takes an instance of HackrfCallbackLibrary as argument and will call the onHackrfReady() method of this instance as soon as the device is ready to use. 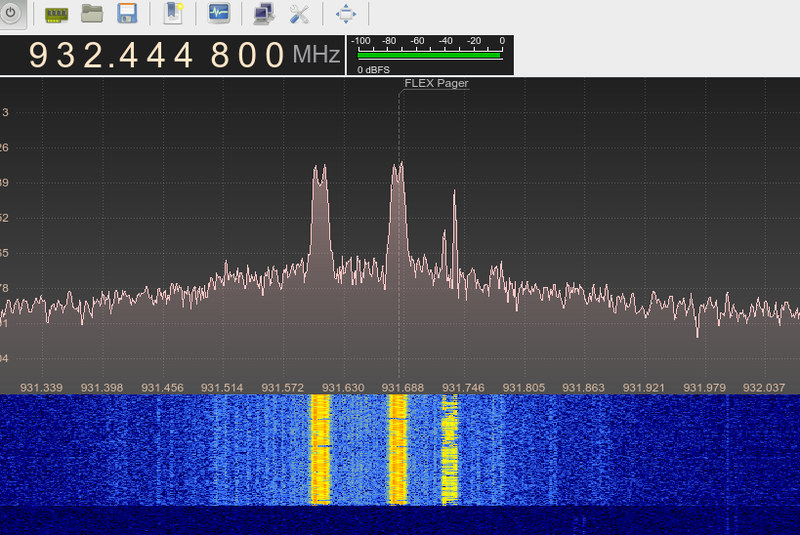 This call contains an instance of the Hackrf class which is then used for all operations on the device. 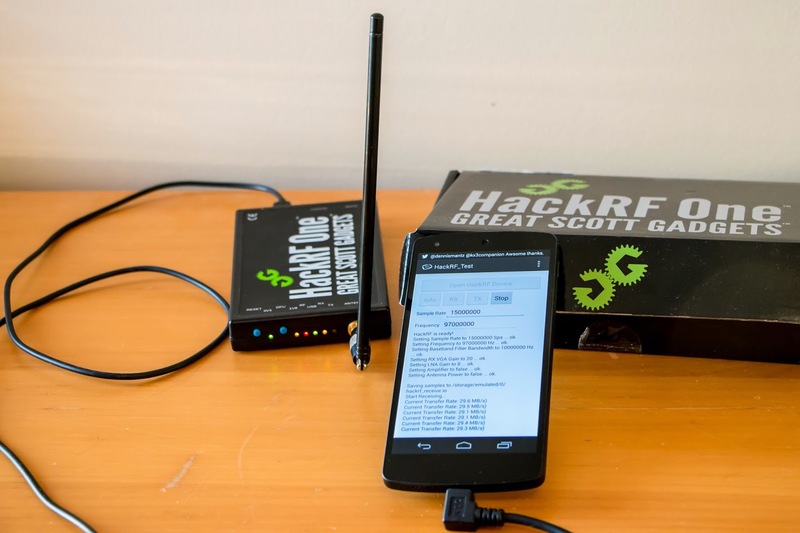 The Hackrf class will put the samples into an ArrayBlockingQueue as they arrive over the USB connection. A reference to this queue will be returned to the application when it calls startRx(). The application can then grab the packets from the queue. Each queue element is a byte array containing the samples. The packets (arrays) all have a fixed length, which can be determined by calling getPacketSize(). These packets are the raw packets that are received through the USB connection. Make sure you pass packets you don't need anymore back to the buffer pool of the hackrf library. Otherwise the performance will drop because of the many memory allocations and garbage collection runs. Inside the packets the samples are stored as signed 8-bit values in pairs of two (first the quadrature sample then the in-phase sample - took me some time to find that out^^). Right now I set the packet size to 16KB. This might not be ideal. 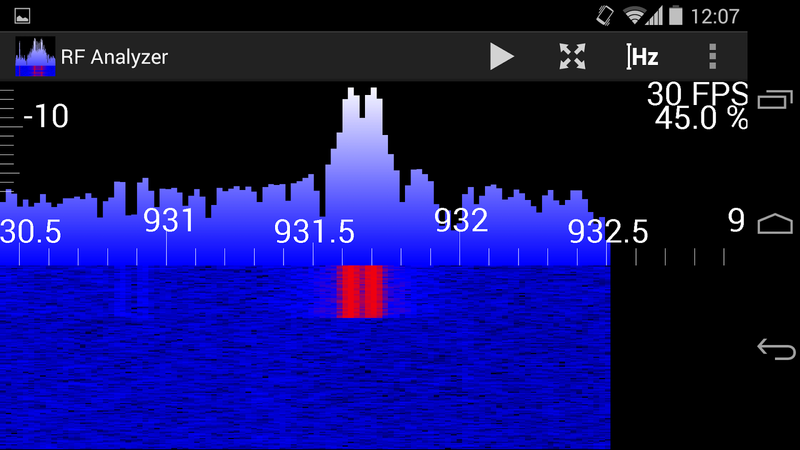 If it is to low (I started with 512B) the samples aren't getting fast enough from the HackRF to the Android device. 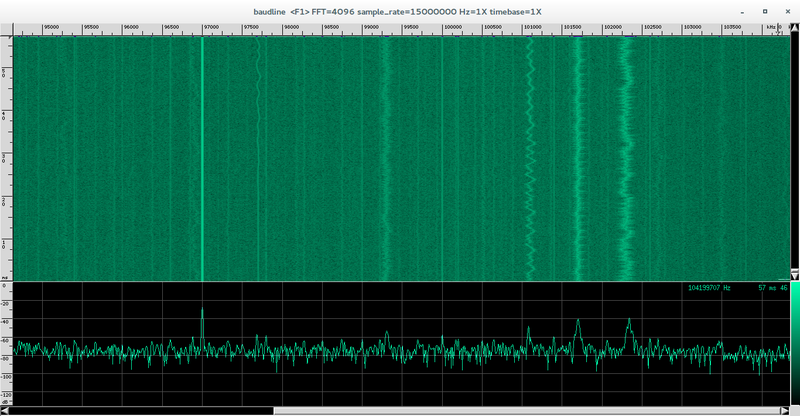 If it is to high (I tried 256KB - same as in hackrf.c) then most of the bytes in the packets will be zero. Feel free to experiment with this, all you have to do is change the packetSize attribute in Hackrf.java. Note that the size of the queue (measured in bytes!) is defined by the application as an argument to initHackrf(). 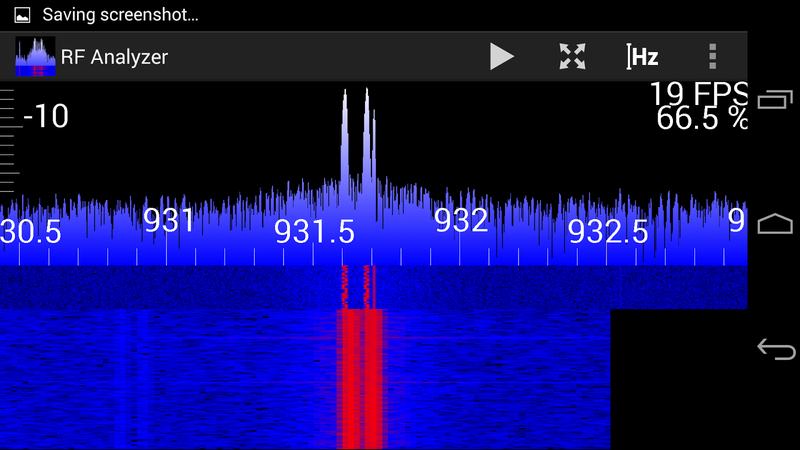 Make sure you choose a large enough queue to buffer the samples between the hackrf library and your application. If the application doesn't pull the samples fast enough out of the queue, it will ran full pretty quickly and the hackrf will stop receiving. What I noticed on the Nexus 7: When writing the samples to a file (using a BufferedOutputStream), you can't set the sample rate to values higher than 2Msps. The write procedure to file will be too slow to get the samples fast enough out of the queue. Can anyone confirm this? It seems strange to me and I don't have this problem with my Nexus 5 (15Msps to a file - works like a charm!). The example application I want to show you is also in the git repository. I used Eclipse with the ADT plugin to write it. If you want to do so too, just create two new Android Projects from existing sources and choose the root directory of the repository for the library and the example directory for the example App. 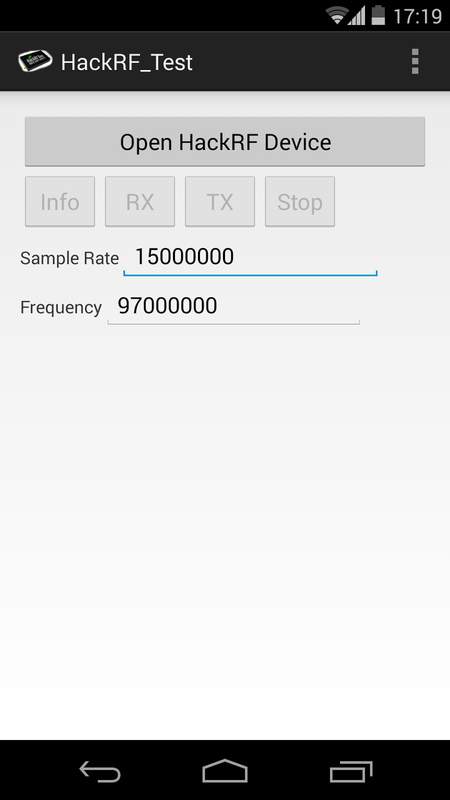 Make sure that the example App is either linked against the library project (this should be the default case) or against the hackrf_android.jar file. File file = new File(Environment. 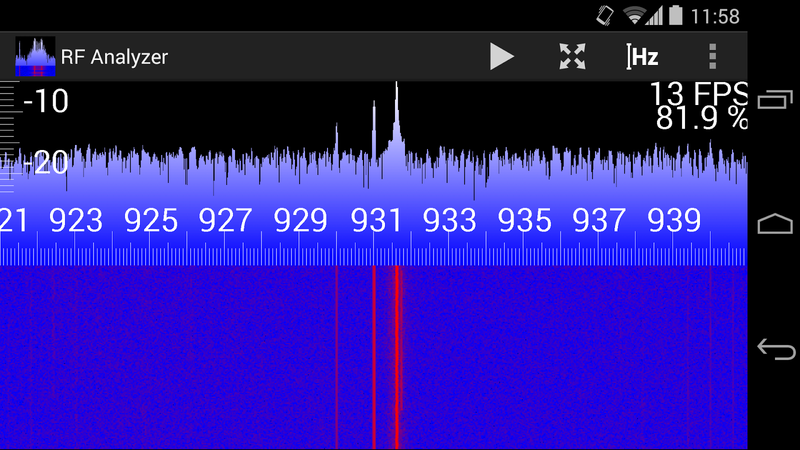 Porting the hackrf library was fun and easier than I thought. 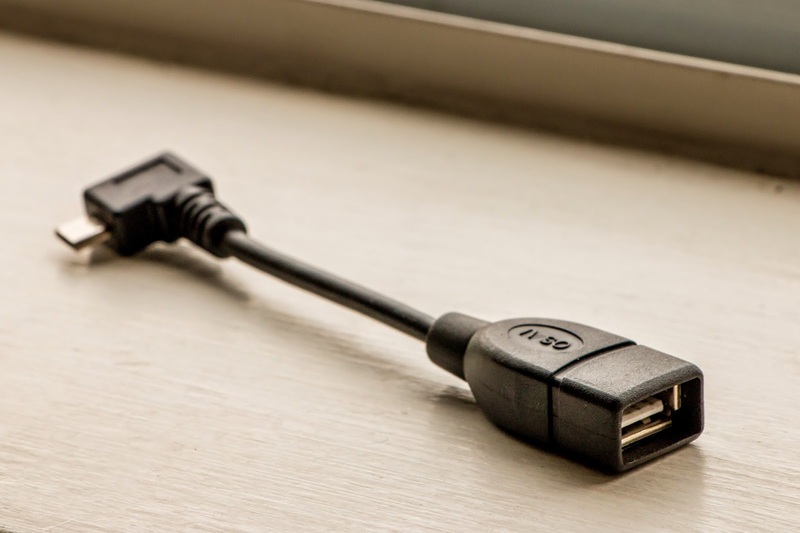 I also learned a lot about USB :) At this point I want to say thank you to Michael Ossmann for creating such a great open source SDR platform. 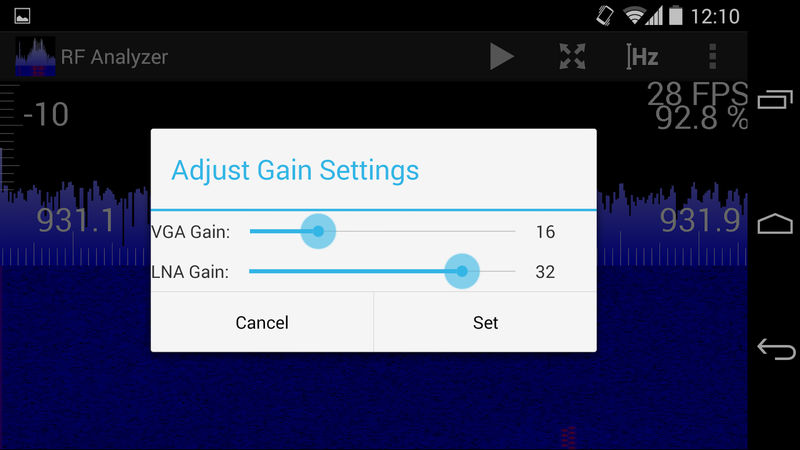 I hope hackrf_android helps to make it even more useful / mobile than it already is! They showed up frequently and on various channels. My first thought was: POCSAG pagers. It turned out that I was wrong, not POCSAG but FLEX pagers. After some more research it seems like TELUS is using FLEX pagers here on Vancouver Island (http://www.nettwerked.net/FLEX_Frequencies.txt). I also found an example GNU Radio script from Parker Thompson (https://github.com/mothran/flex_hackrf). He is pointing out that it is a modification of the original script from Johnathan Corgan, who wrote the GNU Radio blocks for FLEX. Unfortunately it was incompatible with GNU Radio 3.7, so I had to change some pieces. As you can see, there are also lots of bit errors... I might have to work on the tuning. Also the error correction mechanism isn't implemented in the GNU Radio FLEX blocks yet. But nevertheless, I had some fun ;) Hope someone finds this useful. Feel free to leave a comment! 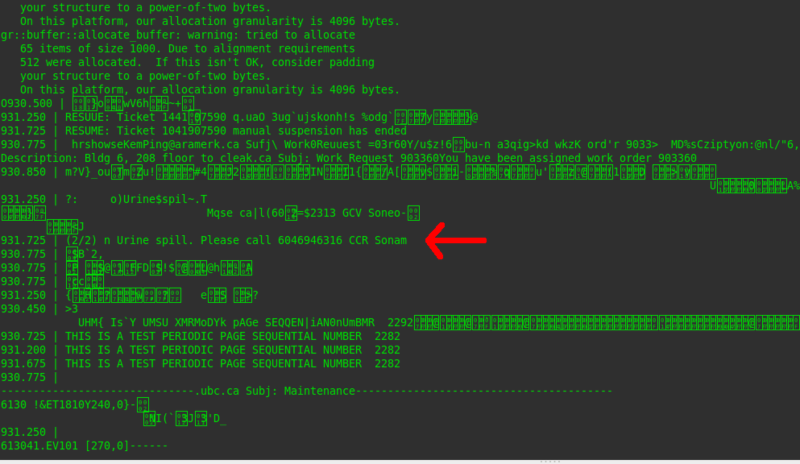 Notice that you have to start tcpdump with the option "-tt" to get this format of timestamps. 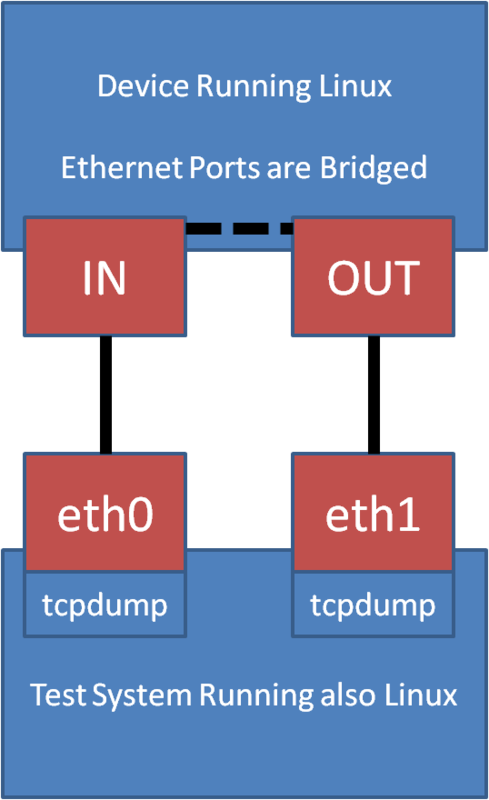 If you just want the time the packet spends in the bridging device, you just have to do this measurement a second time but without the device (eth0 and eth1 short-circuit). Then you can estimate the time spend in the device by again subtracting your 2 measurements. To get meaningful results you definitely want to do this procedure more than once and calculate the average. And then you want to vary the size of the packet, the protocol and so on to see how it's effecting the result. So at this point I decided to automate the whole procedure with a shell script. This has the big advantage that you can do this measurement again in the exact same way after doing some optimization on the bridge. As always I started with a simple script but after tweaking this and that it got bigger and way more complex xD Nevertheless I want to share it, so maybe someone will find it useful too. Tools needed are of course tcpdump to capture the packets, as well as hping3 and arping to generate the packets. I split the script into two: One that does exactly one measurement and another that calls this script in a loop to get the average values. # similar in between to test its performance! echo "Usage: $cmdname -s <src iface> -d <dst iface> [-m <arp|ip|icmp|udp|tcp>] [-p <size>] [-v] [-h]"
echo "$mode is not allowed for mode"
arp -i $ifs -s 111.111.111.111 00:01:11:11:11:11 $verbose # dummy arp entry..
echo "Timestamps aren't set. exiting..."
# Check if it's the same packet! echo "Seems like we've captured two different packets. Is the link free?" echo "latency is $diff microseconds"
echo "Average Latency is $avg microseconds!" echo "Min: $min Max: $max Range (max-min): $range"
# All other args are passed with the $cmdline to measureLatency. Do nothing with them..
echo -n "Round $i: "